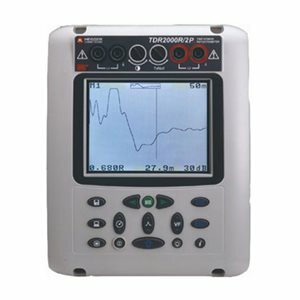 Ideal for engineers with little TDR experience, the TDR20000/2P can perform single or dual channel measurements on a wide range of metallic cables.The Megger TDR2000/2P is a state of the art, Monochrome dual channel Time Domain Reflectometer, capable of identifying and locating a wide range of faults on cables from a few meters to 20km depending on cable type. Cables can be compared with each other or with previously stored traces from memory. Good and bad cores in multi core cables can be compared and just the difference displayed. Either dead or Live cables to CATIII 300V Phase to earth or 415V phase to phase can be tested. The TDR2000/2P is supplied complete with pairs of 2metre long fused test leads, fitted with 30mm gape crocodile clips for easy connection to large diameter cables. No blocking filter is required.